New babies seem so fragile. There’s a temptation to do absolutely everything by the book. They’re meant to do X at this age, and Y by this one.Once you’re on your second child and beyond, you can see how these guidelines don’t always fly, and you can try things (responsibly) a little earlier than you may be advised. Marlo is a very small individual. Once he reached five months, we could still see we were quite a way away from him being able to do much more than gurgle and kick his legs. We had him going from one seated position to the next, a bit of tummy time and plenty of time lay down. It must have been a boring life. 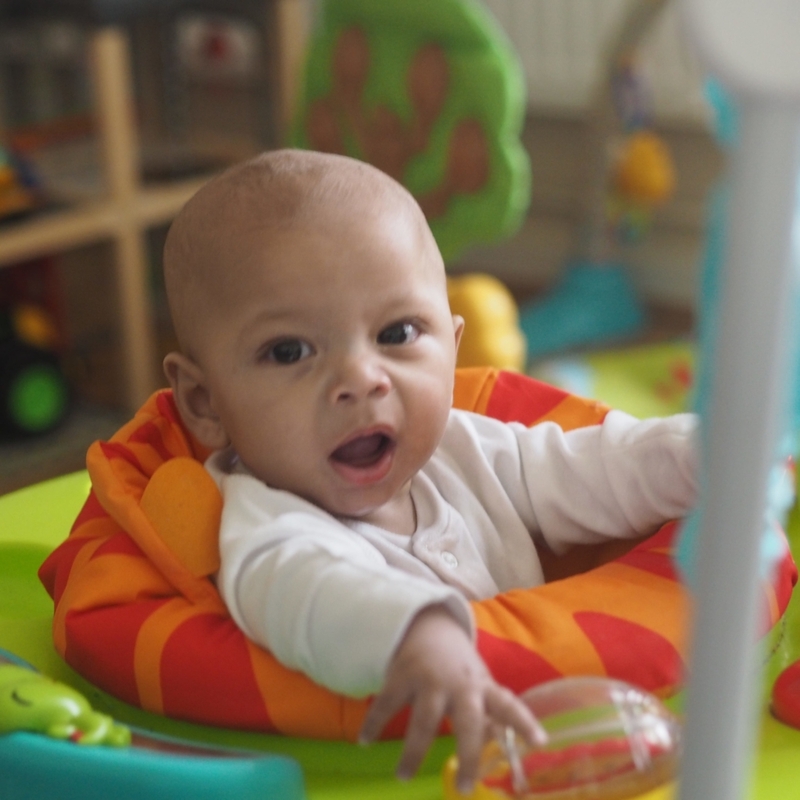 Then Hollie saw that a baby born two weeks after him was living life – this baby was in a Jumperoo, showing what they could really do if you give them the opportunity to. The Jumperoo is an elevated seat that allows the child to safely bounce themselves about, and entertain themselves with lots of different touchy-feely, noisy and musical accessories. Ours was disassembled into a few pieces in our garage. It was time to get it out again and give him the chance to explore a little more. Although the final structure may look fairly complicated, it’s really easy to put the Jumperoo together. Everything just slots into place and you’re good to go in no more than 20 minutes. It’s extremely secure, and even if you have bigger kids around, it’s not the sort of thing they can knock over or even easily move. Despite this too, it’s light and easy to move around a room. The second time we had to put this together, it was intuitive to make without any instructions. The only part you may not quite remember how to do is to adjust the height so it suits a smaller child. I can’t see anyone struggling with this. Our Jumperoo sits in the front room and gets regular use from our 6-month-old. He probably does about three hours in there a day, sometimes bouncing away in there til exhaustion. As I mentioned, he started using it a month ago and was more than ready by the time we got him in there. He spent a lot of time in a bouncer chair, but just wasn’t enjoying it much by 5 months. He had to be watched while he was sitting. Madly enough, he just doesn’t when he’s in this. He’s a lot more secure and less likely to get himself in any trouble. We’re really limited for toy choice with a baby this age, because there’s not a lot he can really do. We want to get him more things, but we struggle to come up with ideas of things he might actually want to play with. All of the little animal characters around it giving us inspiration for where he is in his development and other things to help him learn how to use his hands more. The Jumperoo is our way of getting the little one active. When he’s lay down, the most he can do is roll over (probably only once per session). This gives him the chance to get his core and leg muscles a lot more active, setting him up for when he needs them a lot more in the next few months. We had Cameo in his Jumperoo right up until he was able to crawl for himself, and it’s going to be the same this time around. 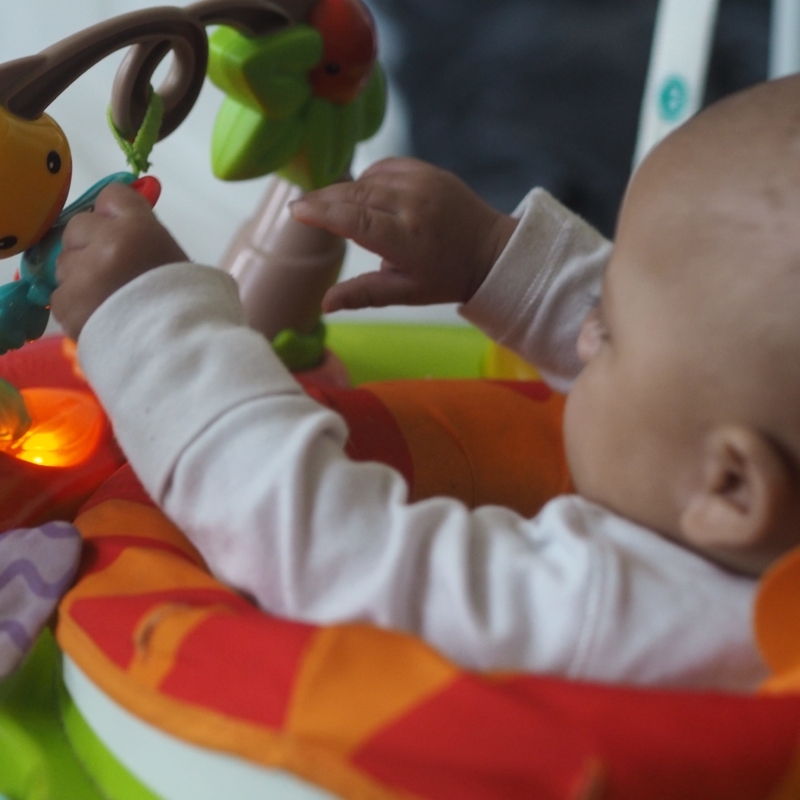 As soon as there’s a bit of power in your baby’s kicks, they’re probably ready for a Jumperoo. From there, it’s going to be one of the best ways to get your child used to moving themselves around.